We’ve been collecting bottle tops for about 8 weeks (when I say we I mean schools, companies, hotels, hospitals, gyms and more) and these were used to create 8, door-sized panels depicting scenes of Qatar. 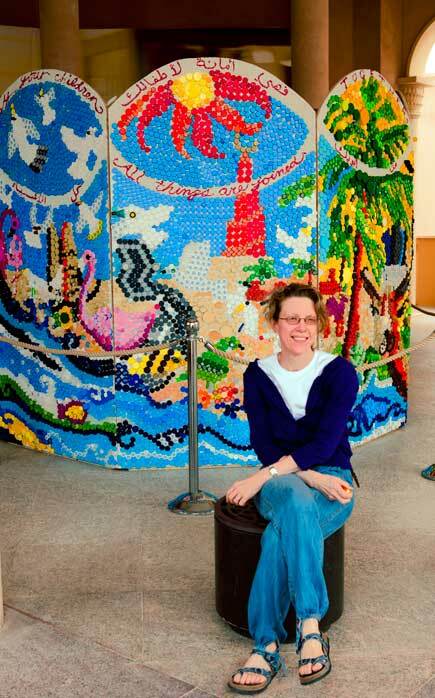 The artwork, designed by my friend and professional artist Seana Mallen who lives in Bahrain, comprises more than 30,000 bottle tops of all shapes, sizes and colours and vividly illustrates how the natural environment and built environment are intertwined. Volunteers from all over Qatar and every age group and background spent two weekends building the work under Seana’s direction. This huge effort transformed the humble bottle top that we usually throw away into a magnificent work of art: From a sea of plastic to a sight to see. Through this project the QGBC-SWIG aims to raise awareness about plastic waste in all its forms and encourage the reduction of this type of waste. We actually collected 60,000 plus bottle tops which represents 60,000 bottles which would fill 320 shopping trolleys! That’s a lot of plastic! I’m looking forward to joining the team in Dubai later on in the tour. I’m also very happy to report that the team was so impressed with the Bottle Top Art project that they are already talking about doing something similar in Bahrain and Oman!